re-emerges within a modern context of mass migration. Nancy Kerr, Rachael McShane, Greg Russell and Matthew Crampton. generations of folk musicians have gathered to re-create the piece. This new production features musical arrangements by Paul Sartin of Bellowhead and Faustus. Kirkpatrick and Saul Rose, and Greg Russell. tale into a broader exploration of exile and migration. power in portraying the way the world actually works. 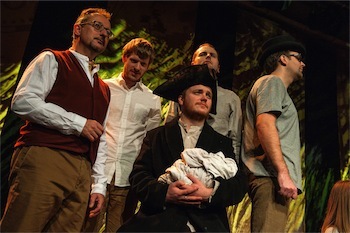 ★★★★★ "Stunning….truly a transport of delight"
★★★★ "an ensemble success….ten voices uniting in magnificently lusty, rousing chorus"
"Truly stunning ensemble singing and individual instrumental virtuosity"
"Superb…the best piece of work I have seen in a very long time"
"The Transports is truly magnificent"
"Thought provoking, beautifully performed, hopeful, educational, inspirational - a triumph"
"One of the best stage performances in a very long time"
London. Tickets were snapped up in two days.